Scratch is a networked, media-rich programming environment designed to enhance the development of technological fluency at after-school centers in economically-disadvantaged communities. 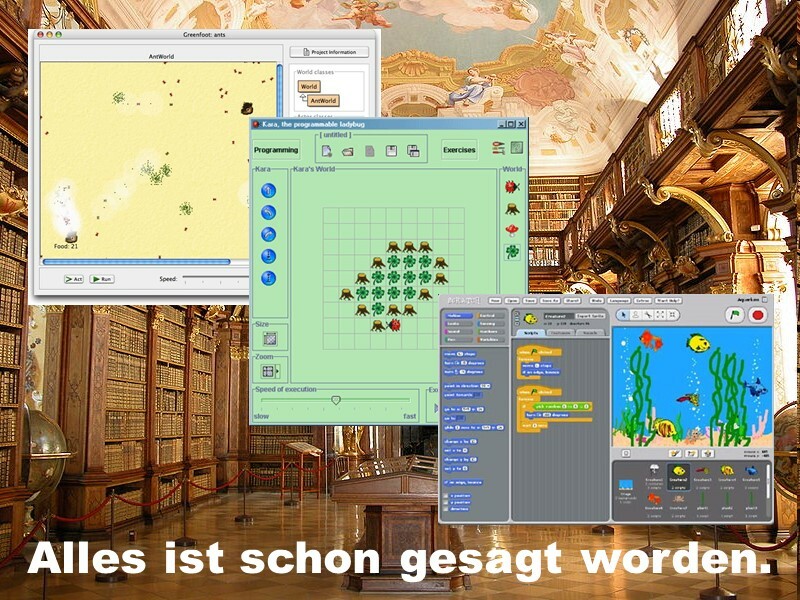 Scratch ist eine moderne Programmierumgebung für die Entwicklung interaktiver Spiele und anderer multimedialer Systeme. Scratch wurde in den letzten Jahren im Media Lab des MIT unter der Leitung von Mitchel Resnick entwickelt (www.scratch.org). Scratch enthält eine textuelle Programmiersprache, aber Programmtexte werden aus vorgegebenen (visualisierten) Bausteinen zusammengesetzt. Damit gibt es keine Syntaxfehler und das Programmieren ist für Anfänger sehr viel „schmerzfreier“. Schnelle Modellierungszyklen des Veränderns und Testens werden unterstützt. 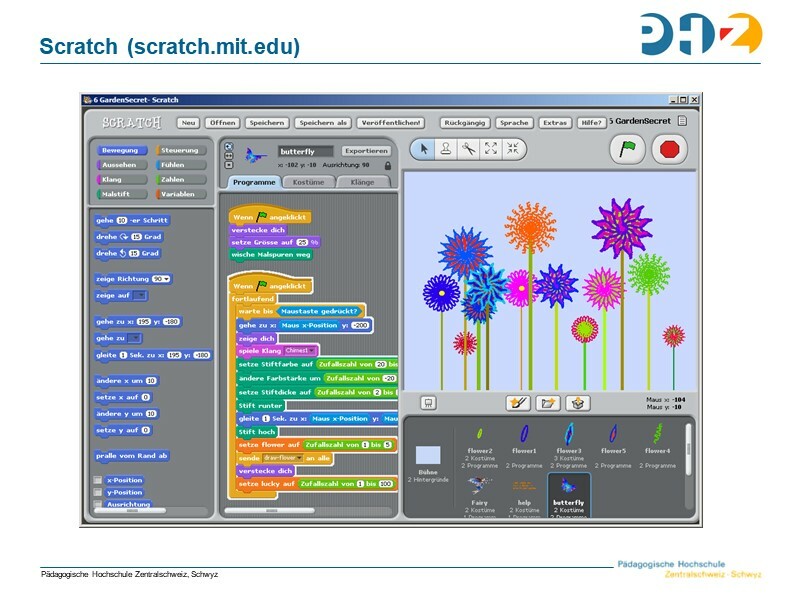 Scratch (http://scratch.mit.edu), created by the Lifelong Kindergarten Group at the MIT Media Laboratory, is a media-rich system for novice programmers. 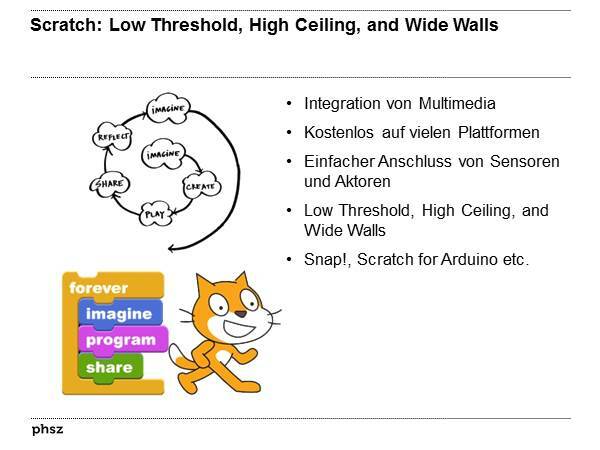 For an overview of Scratch, see Resnick et al. (2009). Programs in Scratch are composed of scripts which control sprites displayed on a stage. Scripts are created by dragging and dropping blocks that represent program components, such as expressions, conditions, statements, and variables. A sprite may have multiple scripts and they are all executed concurrently. The environment eliminates syntax errors and gives immediate visual feedback through the behavior of the sprites. Scratch is augmented by a social computing network for sharing projects. 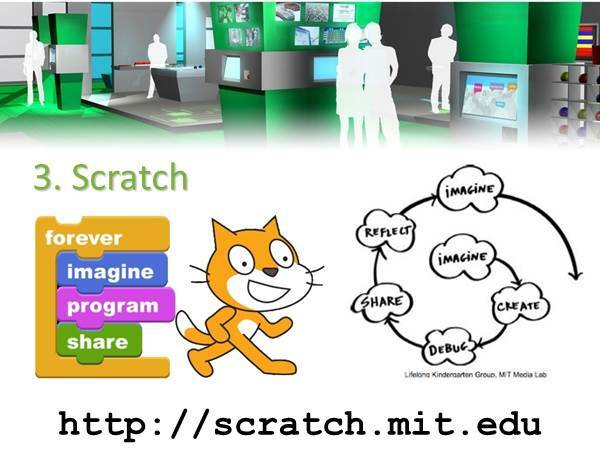 Scratch has been developed at the MIT Media Lab by the Lifelong Kindergarten group directed by Mitchel Resnick. 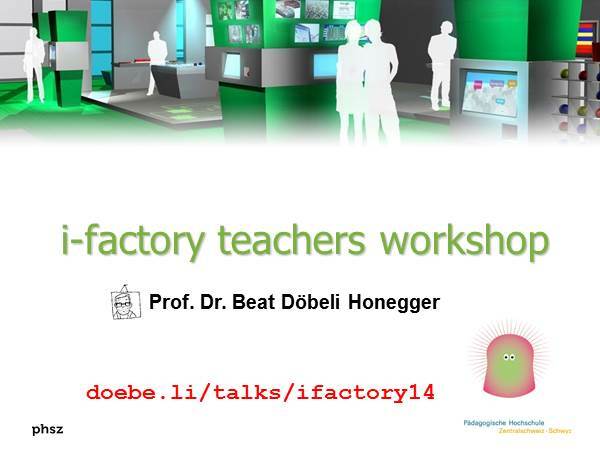 The aim focused on building a system for beginners where they could express themselves and their creativity while being introduced to informatics . It is not only a programming language: it also provides an environment where a user finds several integrated tools (for drawing and recording, for example). More generally, Scratch is a system for producing stories that can have one or more characters (Sprites) acting on a Stage, with one or more Backgrounds, and sounds of different types (for example voices, music, noises). Characters behave as specified by means of code sequences, called Scripts. Here the word script is to be intended mostly as referring to roles in the theatre, or cinema. Scratch is written in Squeak, an open-source implementation of the Smalltalk-80 language. Despite its flashy exterior, Scratch is a sophisticated software system and it takes time to learn ist technical and pedagogical aspects. Scratch source code will be made freely available via periodic code releases to allow collaborators to augment the core system with their own custom features and extensions. Most programming languages (and computer science courses) privilege top-down planning over bottom-up tinkering. With Scratch, we want tinkerers to feel just as comfortable as planners. Learning lessons from Papert’s experiences of Logo, we’ve designed Scratch to move beyond Logo along three dimensions, making programming more tinkerable, more meaningful, and more social. Sharing and exchanging of Scratch projects and their components will be supported through a combination of standard web servers (with content viewed in a web browser) and a custom “Scratch Object Library” server. Die Einschränkungen von Scratch sind im den Bereichen Modularisierung und Datenstrukturen offensichtlich, obwohl lokale und globale Operationen und Variable sowie Zeichenketten und lineare Listen zur Verfügung stehen. Probably the biggest challenges for Scratch are not technological but cultural and educational.10 Scratch has been a success among early adopters, but we need to provide better educational support for it to spread more broadly. Making animations (with tools such as Macromedia Flash) is an increasingly popular activity at Clubhouses. 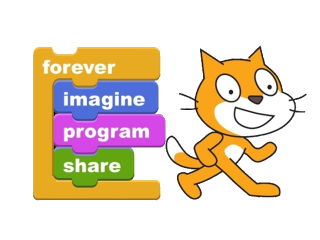 With Scratch, Clubhouse members will be able to create an animation, upload it to a Scratch library server, and then track how it is used or modified by others. Overall, Scratch has proved to be a viable platform for teaching CS, but we do not believe that effective learning will be achieved by itself withoutclose and effective mentoring. Left to themselves, many students will only use Scratch as a tool for creating media and learn very little. There needs to be a shift in how people think about programming, and about computers in general. We need to expand the notion of "digital fluency" to include designing and creating, not just browsing and interacting. Only then will initiatives like Scratch have a chance to live up to their full potential. We wanted to develop an approach to programming that would appeal to people who hadn't previously imagined themselves as programmers. We wanted to make it easy for everyone, of all ages, backgrounds, and interests, to program their own interactive stories, games, animations, and simulations, and share their creations with one another. When a tool like Scratch is used in a school setting, it is important that high-quality learning materials be available, so that teachers can follow a specific syllabus and not be required to develop every lesson by themselves. This is especially important for middle-school teachers who tend to have a less-advanced academic background in the subject matter. Probably the biggest challenges for Scratch - and for realizing for Papert’s dream - are not technological but cultural and educational. There needs to be a shift in how people think about programming, and how they think about computers in general.We need to expand the conception of digital fluency to include designing and creating, not just browsing and interacting. Over time, I hope that Scratch will become the standard way for people to access and control all types of programmable media, whether they are designing animations, controlling robots, accessing sensor data, or integrating web services into their projects. So it will become more and more valuable for children to become fluent with Scratch, just as they become fluent with writing. Scratch ist genau das richtige Werkzeug fur den Einsatz in der Algorithmik in der 7. 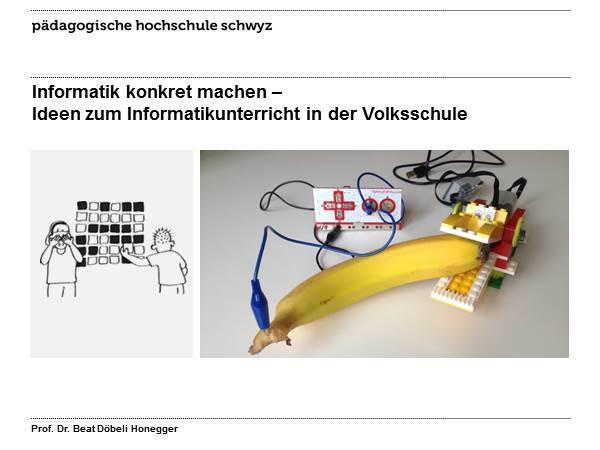 Jahrgangsstufe und vermittelt grundlegende Ideen zu weiteren ganz wichtigen Konzepten der Informatik. Zudem eröffnet es im Gegensatz zur eintönigen Welt vom Robot Karol die Möglichkeit zu immer wieder neuen Aufgabenstellungen mit neuen Akteuren. Damit lässt sich Langeweile aufgrund ähnlicher Aufgabenstellungen vermeiden. The idea was to develop a programming language that builds on the media practices that already were favored by youth in their leisure time. This language would allow participants to make graphics, animations, and games. It would not be confined to a particular purpose, would provide a low entry threshold for beginners with no prior experience, and would be able to be scaled up to more complex projects. Scratch (ist name a play on populär DJ practices of making and remixing music) moved away from the focus on mathematics and science that traditionally was associated with programming. 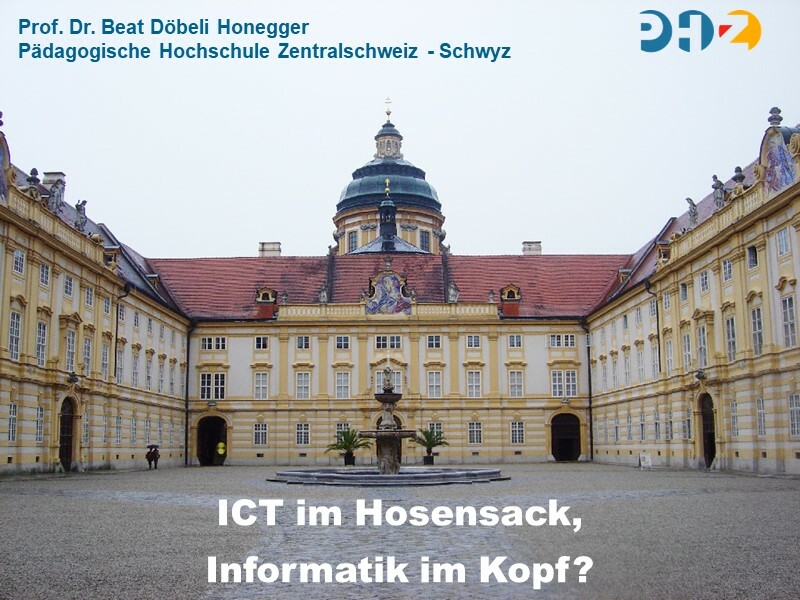 Der Erfolg von Scratch im Ausbildungssystem ist eigentlich verblüffend: ein für Kindergarten und Grundschule konzipiertes und designtes System wird nicht nur in den Sekundarstufen, sondern sogar in der universitären Grundausbildung erfolgreich eingesetzt – und das nicht in irgendwelchen Klitschen, sondern am MIT oder in Berkeley. Die Not muss also groß sein! 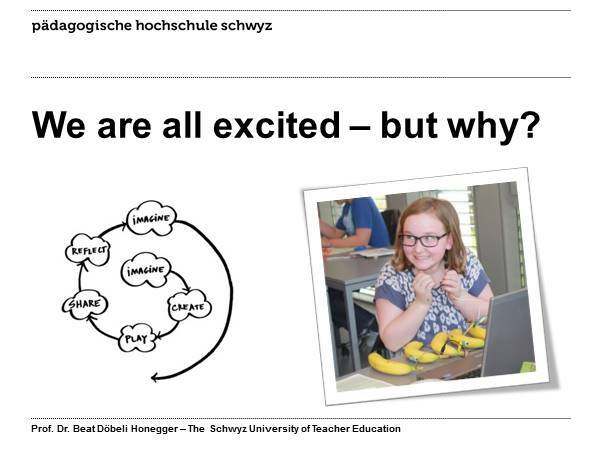 Ein „Kindergartensystem“ sollte eigentlich für die universitäre Ausbildung ungeeignet sein. Wird es trotzdem benutzt, dann hält ein Teil der Ausbilder die traditionellen Ausbildungswerkzeuge offensichtlich für noch ungeeigneter. A future version of Scratch may even allow youth to download animations to handheld devices and exchange them via IR or Bluetooth. Youth can modify animations that they receive (since all Scratch “program blocks” are accessible), or they could even program an object to behave differently depending on the age, gender, or location of the person receiving it. The Scratch server will automatically keep track of all transactions, so youth can view tree-like graphs representing the spread of their animations, with indicators of how and where the animations have been modified. Through these activities, we hope that an ecosystem of Scratch creations will develop, with Clubhouse youth trading and modifying one another’s creations. Almost everyone knows how to use a computer. We use them for surfing the internet (email, downloading music and videos, chatting, shopping), for writing documents and for playing games. Aren’t you curious to learn how these amazing applications are built? Well, they are built as computer programs, which are written in programming languages that a computer can understand and run. Unfortunately, programs like internet browsers and word processors are very complex - they can have millions of instructions in a programming language - and the languages themselves were designed for professional programmers and are difficult to learn. Here is where Scratch comes to our rescue. Scratch is easy to learn and you can build programs for a computer (or, as we say, to program the computer) immediately when you start to work with Scratch. Furthermore, Scratch supports the use of graphics, animation and sound without requiring that you understand the technical details. Don’t let the colorful presentation of Scratch fool you! It is not a computer game. Scratch is a real software development environment, and experience with Scratch will provide you a glimpse of what it is like to program a computer professionally. It is lots of fun working with Scratch, and the programs you develop can be exciting games or interesting simulations, but during the process of creating these programs you will face the same challenges faced by a professional programmer: What is the computer capable of doing? How can our wishes and needs be translated into instructions that the computer can understand and run? How are errors diagnosed and corrected? We are certain that studying Scratch in depth will be a fascinating experience. Scratch - häufig zitiert, trotzdem nie definiert. Im folgenden wird aus diesen Überlegungen versucht, das Thema genauer zu formulieren. 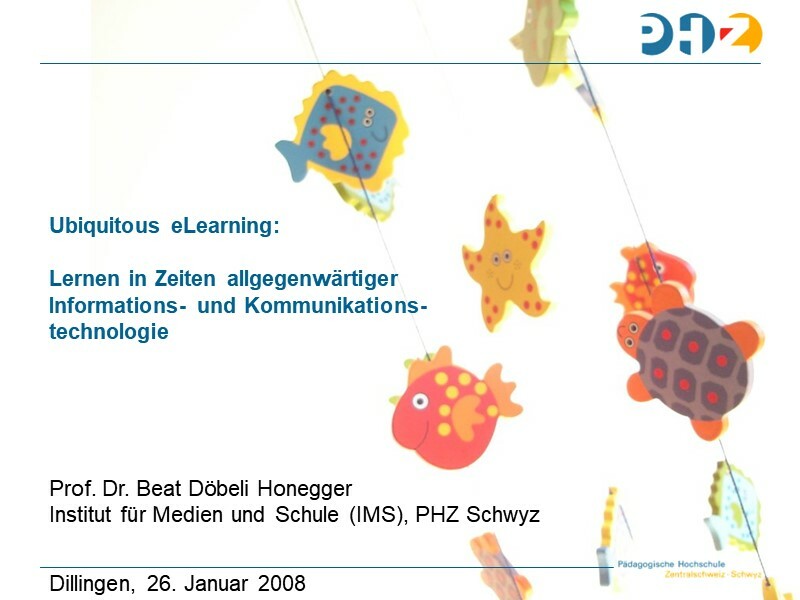 Im Jahr 2008 wurde der Begriff zum ersten Mal besprochen. Wer erinnert sich noch genau an diese Zeiten? Allgemein gilt Mitchel Resnick als renommierter Wissenschafter für dieses Thema. Doch auch Yasmin B. Kafai hat diesbezüglich einen guten Ruf.